As I said in my post about making ramen cabbage salad, we’ve been on a Ramen binge lately (after I got hooked on SeriousEats.com and “The Mind of a Chef” – both of which had some awesome features on ramen noodles). 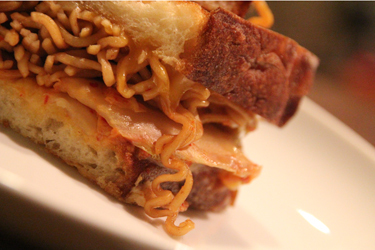 Well tonight for dinner, Nick said, “I’m gonna make you a treat,” and decided to try a recipe he found on TasteSpotting.com for a “Kimchi Ramen Grilled Cheese Sandwich.” Some of my most favorite things in the whole wide world. I love that man. So I guess I’ll address some of the questions people might have about this sandwich. First, “Noodles, in a sandwich?” Yeah, like TasteSpotting.com, I have an issue with “grain-on-grain,” but this is also similar to the awesomely delicious Thanksgiving Grilled Cheese sandwich that I wrote about a while ago, which has plenty of starch sandwiched (ha!) between two slices of bread. 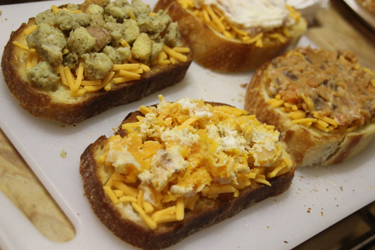 And I am ridiculously thankful to have found SeriousEats.com, and that fantastic twist (grilled cheese) on an already delicious leftovers idea. And while I will agree that this sandwich *could* totally be improved with the addition of some meaty goodness (a few slices of leftover steak or chicken would be heavenly), the noodles and they way they’re prepared before they’re added (be sure you don’t overcook them!) really do a fine job of taking the place of meat here, which is one of the points of this sandwich. If you don’t have any protein in the house (save the cheese) and you’re looking for something “meaty” to put in a sandwich, nicely seasoned, “al dente” ramen noodles are not a bad substitute. Also, “Kimchi? In a sandwich?” To that, I say, “Of COURSE!” I love the stuff. 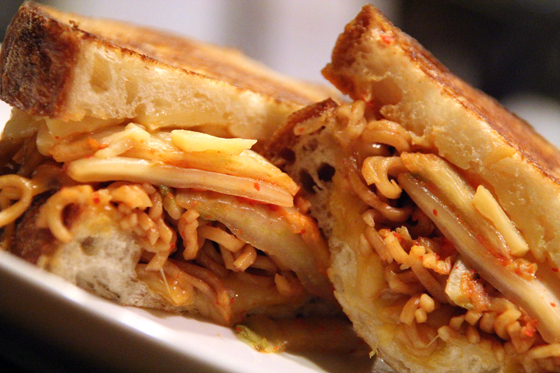 Kimchi (or Kimchee, as I usually spell it – it’s all phonetic anyway) goes with seriously, just about anything savory. Its light crunch, its spice, and its tangy bite compliment everything from salty-sweet asian foods (one of my signature dishes is Kimchee Fried Rice, which I actually made “Paleo-style” with cauliflower rice for the first time this year!) 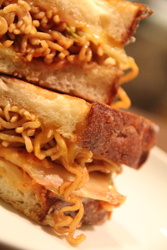 to leftover rotisserie chicken, to yes, a grilled cheese sandwich – especially when paired with the ramen noodles. “Seriously? 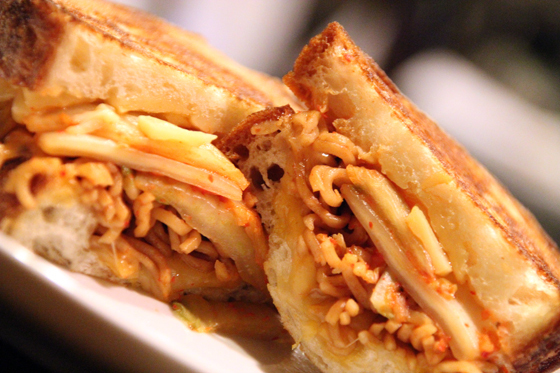 Cheese, and ramen noodles, and KIMCHI?” Yes. 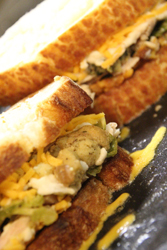 There are few things in this world more comforting and satisfying than a buttery, crispy, grilled cheese sandwich. Or savory, starchy, nicely spiced noodles. Put them together? Heaven. Try it. You’ll like it. What, you mean people DON’T put kimchi in their sandwiches? And what’s so strange about grain on grain? Think spaghetti and meatballs with garlic bread!